Preface. 1. Basic characteristics of synchrotron radiation and its related facilities and instrumentation (M. Terasawa, M. Kihara). 2. X-ray fluorescence analysis (H. Saisho, H. Hashimoto). 3. Microbeam and chemical state analysis (S. Hayakawa, Y. Gohshi). 4. X-ray absorption fine structure (H. Oyanagi). 5. Application to surface structure analyses (T. Ohta, K. Asakura, T. Tokoyama). 6. Structure analysis by small-angle X-ray scattering (K. Kajiwara, Y. Hiragi). 7. The Rietveld method and its applications to synchrotron X-ray powder data (F. Izumi). X-ray microtomography (K. Usami, T. Hirano). Subject index. Synchroton radiation (SR) is utilized in most scientific fields. 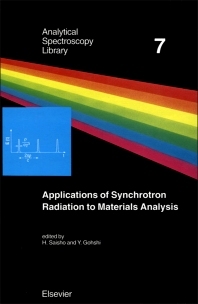 This book will therefore be useful not only for researchers engaged in analytical chemistry, and those studying the basic fields such as physics, chemistry, biology, as well as earth science, medicine, and life science but also for those engaged in research for elucidating structure of material and its function in the application fields including applied physics, semiconductor engineering, and metal engineering. The book has a highly interdisciplinary character. The outstanding characteristics of SR have also contributed to the rapid development of new fields and applications in analytical chemistry. • Facilities and instrumentation are covered to facilitate the planning of experiments using SR.
• Aspects for the future development of SR are included together with an introduction to the latest techniques which are expected to find increasing use in the coming years. This book should stimulate students specializing in analytical chemistry and materials science to have an interest in SR. In addition, it will provide scientists who are beginning analytical chemistry research using SR with instructive and illustrative descriptions. The book can also be used as an explanatory text for advanced research on the application of SR.